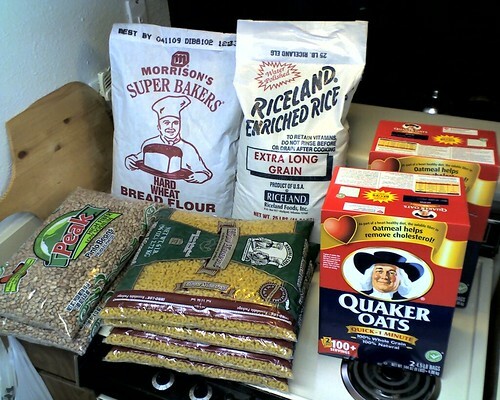 Bulk shopping can be one of the best ways to save money on things you use month in and month out. I personally have been buying certain things in bulk for a long time and although you really have to pay attention to what you’re doing, you can save a ton of money this way. 1. Write the date and price on everything yourself. Even if something has a date on it printed by the manufacturer, write a date of when you actually purchased it and the price you purchased it at. There are a couple reasons to do this. First, you can get a better gauge of how much you saved because you will know exactly when the product was purchased and when you ran out. Using these dates, you can divide the price by number of days you had the product and see your total savings. Second, by marking the price on the item, you can see if the price has changed in stores the next time you are shopping for that product, and know whether you are getting a good deal at the time or not. 2. It’s still best to shop around. Just because something is sold in bulk does not necessarily mean it is cheaper than buying things in separate packages at a regular grocery store. In my experience, stores that carry items in bulk only carry the name brands. Since my wife and I buy generic whenever possible, buying name brand things in bulk doesn’t always make sense as the total cost is more expensive, however convenient the bulk packaging may be. Look at the Cost Per Unit and see if it compares to the Cost Per Unit at the store you regularly shop. It really helps to keep a running grocery list so you have a frame of reference. 3. Know what you need. When shopping at the bulk food stores, it’s really easy to go overboard. Just like any other grocery shopping experience, you should always have a list of what you need and for the bulk food shopping trips, mark on the list how much you usually use so you know if you are buying too much. Remember that if your food or goods expire before you can actually use them, there is really no point in buying them in bulk. 4. Know what expiration dates mean. When bulk food shopping this is especially important. There are different ways expiration dates are written on food, and they actually mean different things. Best Before or Best By: These dates are only advisory. The product remains edible and safe for some time after the Best By date. However, the food may change in taste or texture after this date. In my family, we will keep Best By products until they start to taste funny, then we throw them out and replace them. *Eggs are one exception to this, as they can become harmful if used much after the Best By date. Use by: This is an actually expiration date and if the product is used after this date, it can be harmful to you. Sell by: These dates are for stores to keep track of inventory. It’s still OK to use products after their sell by date, as long as you are within the use by date. Products with a sell by date are usually things that expire fairly quickly and are put on clearance at stores, even bulk food stores, the closer they get to the sell by date. Bulk shopping can be a great tool to cut costs on the staples in your home, and by following these tips, you can get the most out of your bulk shopping experience. I always find others’ take on the stocking up to be interesting. I’d suggest a notebook or if you want to go high tech, a spreadsheet to track pricing until it becomes something you just know. There’s also the issue when you have a family that the spouse says they want a particular brand, so it’s one thing to know the killer price on “bar soap” is say 4/$1, but the price on Dove is $1.69 regular, and anything under a dollar even is deal territory. As far as expiration dates go, be sure to rotate the stock on canned items. Things like salad dressing unopened, I’ve used years past exp date. YMMV. < your mileage may vary if you are too old/young to know this abbreviation. Ya it is interesting how others approach food buying and usage. It took my wife some time before she would even try generics, and there are just a couple things she still prefers the name brand even after trying the generic, but she will always try the generic now because she sees the cost benefit. Rotating stock is a great idea as well, even with water you stockpile! Great stuff, I especially love the explanation of the different dates and what they mean. That is always something that I think many, myself included, struggle to understand, and probably use product incorrectly as a result. Hey no prob! It's not like they print that stuff on the label, ya know. The manufacture would probably prefer we didn't understand the expiration labels so we just threw everything out on that date, but it's a waste of food and money! Money Beagle on Is Auto Assure a Scam? Money Beagle on Amazon Prime Review – Is It For You?